The global policing group Interpol and Europe’s police body have announced that they have joined forces to fight piracy off the Horn of Africa. Interpol and Europol signed an agreement yesterday to establish a “global police initiative” to combat threats of piracy. The venture will include a new analysis project at Netherlands-based Europol while Interpol, headquartered in the French city of Lyon, will collect information on suspected pirates into a central database, they say in a joint statement. Interpol Secretary General Ronald Noble and Europol director Rob Wainwright agreed their organisations are ideally placed to join forces for a global police response to serious crime and terrorism. “Today’s meeting marks a sea change in the co-operation between Europol and Interpol”, Noble said at Eurpol’s Den Haag headquarters. 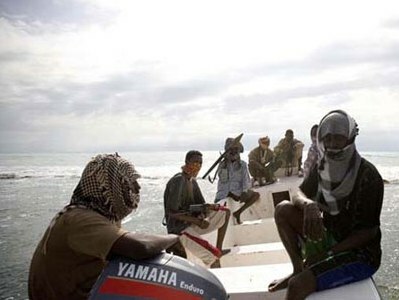 French news agency AFP reports that modern-day pirates have since 2007 made the waters off the Horn of Africa among the most dangerous in the world, seizing cargo ships and fishing vessels and demanding hefty ransoms for their release. The news agency says attacks are seen as a threat to one of the globe’s most crucial maritime trade routes. The European Union, NATO and other powers deployed warships to the pirate-infested waters in December last year and the attackers have shifted their focus to the wider Indian Ocean, a huge area much more difficult to patrol. It has been difficult to bring captured pirates to justice in part because of insufficient evidence against them and a lack of legal provisions, AFP added. Meanwhile, defpro reports retired Rear Admiral Terence McKnight, the past commander of the Combined Maritime Forces (CMF) operating out of Bahrain against both pirates and al Qaeda terrorists last week said the piracy problem was over-stated. McKnight, who also headed the counter-piracy Combined Task Force 151, was speaking at a lunch time lecture at the National Naval Museum in Washington DC. The task force is currently made up of up to 25 warships from more than 20 nations. He noted that though more than 30 000 ships transit the area annually only 27 attacks have been successful in 2009. “Yet world attention, particularly media attention, is drawn to Somali piracy in the Gulf Aden, which is a very minor problem in the large scheme of things,” he said. The admiral noted added that the ships that fell prey to pirates had been warned and counselled by the CMF in how to protect themselves. “We have set up a registry for ships that are transiting the Gulf so we will know when they will be in the area. They are also provided a checklist of vulnerabilities that the pirates are looking for. If the ships vulnerability checklist suggests they might be a target, the task force will try to protect them,” added McKnight. The admiral said simple things make ships targets; slow moving (less than 10 knots), no lookouts, and easy access from the water. He also said that Somalia piracy is a seasonal event from late fall to early spring. “And, it usually happens in the morning in a specific 400 mile stretch of the Gulf,” he said. The former task force commander said after a review of the entire history of attacks the CMF identified the area of exposure and that is where they concentrate their protection. Another rumour associated with piracy is that the ransoms are being used to finance terrorism. McKnight reassured the audience that there was no evidence to support a connection with terrorism,defpro added. The retired admiral was asked what the best way to stop the pirates was. “A functional government in Somalia with a rule of law, a court system, prosecutors and law enforcement,” he answered. He said prosecuting the pirates that are detained is a logistical nightmare. “Since there is no competent government in the area of operation the pirates have to be transferred to courts that will accept jurisdiction. This requires transportation, jailing for the pirates, the gathering and securing of evidence, security escorts for the pirates and witnesses to testify in the trials, and so on.” The result is that the pirates are usually detained and released. “For now, the best way to stop piracy is to make it less attractive, more dangerous, to the pirates. Things like barbed wire fences around decks, high speed transit through the area, fire hoses, noise makers that sound like gunfire, lookouts, even glass on the deck of the ships (since most pirates have no shoes), these are the things that will slow piracy,” McKnight concluded. The CMF created the Maritime Security Patrol Area (MSPA) in the Gulf of Aden in August of 2008 to support international efforts to combat piracy. Ships from Russia, China and Saudi Arabia, as well as many NATO countries have joined in the task force.